Yes, you read that right. And, you think I’m off my rocker. It’s okay, ‘cause I probably am. I am training for a half ironman, which I do believe instantly qualifies someone as off their rocker. Rocker status aside, today, I had to share with you one of my “clean out the fridge” muffin creations, because it is surprisingly good and is good for you too. Our last CSA product box was full of greens, and I have been on a mission to use everything up before the new box comes tomorrow. Joining a CSA is the best thing I’ve done to amp up our veggie consumption – you are obligated to eat everything in the box so you feel you’re getting your money’s worth. After all that, I still had just about 2 cups of chard left over on Saturday, which is my non-official clean out the fridge day. Alongside the chard, I had some prepared white beans, pumpkin leftover from the Pumpkin Tofu Pudding, and of course, I always have apples. You see where this is going, huh? I have been on a muffin kick lately because they’re just so easy to make and easy to portion for a fast and filling breakfast. 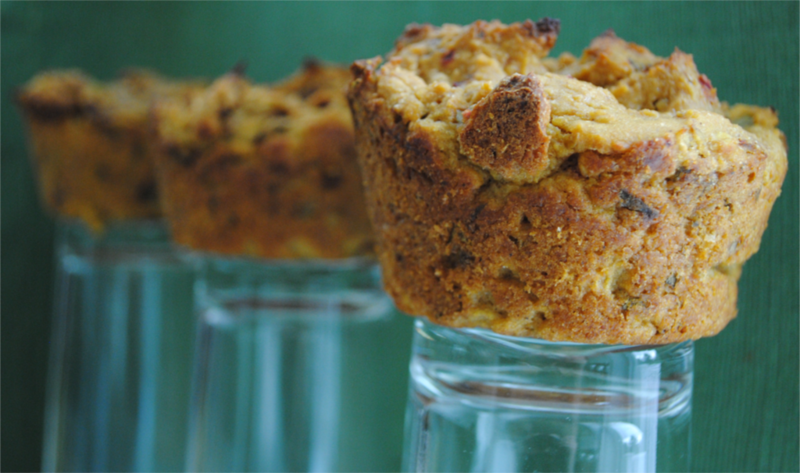 These muffins may just be my favorite yet. The natural sodium from the chard is a nice balance to the pumpkin, and of course, pumpkin makes just about anything delicious. Trust me, no one will notice the chard – it’s a sneaky way to work some greens into your day! Use beans interchangeably. I have baked with garbanzo, lentil, and white beans with pretty much identical results. For muffins, one cup’ll do you. Don’t have pumpkin? Use sweet potatoes, butternut squash, or another winter squash variety. 3/4-1 cup pureed is ample. Apples are your friend to lower fat. But, pears work too. If you don’t have either, there is always the old standby – oil. You can use apples and oil interchangeably 1:1. Spice it up. I am a fan of cinnamon, nutmeg, and ginger in just about anything. But, use what you have that you like. Flour and oats for bulk. I like whole wheat flour cut with rolled oats. But, unbleached white flour, pastry flour, or any variety of specialty flours can work. Also, wheat germ or oat bran are good instead of or in addition to the oats. I just didn’t use any in this recipe. Brrr! It seems winter has reared its head one last time here in the Northwest, and we have been treated to fairly chilly temperatures. Nothing like what the Northeast has experienced this year, by any means, but it is cold and snowy – strange for Seattle. I had to shift a planned 90 minute run to the treadmill on Thursday, and today, I’m off to spin for 2 hours on the bike trainer. Technology becomes incredibly important at these times to provide entertainment and distractions! A Real Honey of an Announcement – Angela’s Random Musings. Okay, okay. This is shameless self promotion. I found out yesterday I will be part of the Honey Stinger Hive grassroots sponsorship program. This is quite simply, awesome news. Honey Stinger makes my most favorite energy products. The ingredients lists are short and organic, and, they are very tasty. The Honey Stinger waffles are sinfully delicious. I’m stoked! Twenty Ways to Get out of a Food Rut – Eating Rules. If you’re in a rut, there might be something on this list to help you shake it! Hyper-caffeinated coffee prices hit 14-year high – CNN Money. Now might be a good time to stock up on coffee, if you’re so inclined, ‘cause prices are only going to go up. I realized when I was entering my receipts that one reason we are able to come close to the budget is I don’t buy that many fully processed foods. That’s a good thing, and it’s lighter on the pocketbook too. I’d say we’ve been falling into the 80/20 rule: 80% “ingredients” and 20% ready-to-eat, or pre-packaged. The baby apples from Amazon were a bad purchase. That is the one downer to buying produce online – you can’t tell exactly what you are getting. There turned out to be 5 baby apples (about half the size of a normal apple) for $3.99. So, not the best value. One big money saver for us is bread. I have been making our bread for about a year now – and that has turned out to be a huge saver. Bread without HFCS in it is pretty expensive to buy, but cheap to make! This is the bread that is 2Chili’s favorite. I either make a French loaf or put it into a pan and have a traditional loaf out of it. Forgive me readers, for I have sinned. I tested a recipe ages ago that I have not shared with you. And, it is perhaps one of my favorite recipes evah. Today, I am bringing veggie back. From the depths of my three ring binder, that is. For this week’s Test Kitchen Tuesday, I really needed something fast and easy. I had moonlighting writing projects scheduled deep into the evening, and somehow needed to get in a weights workout after my day job and still prepare a nice dinner. This lasagna did the trick, as it let me prep it, throw it in the oven, and go off to curse see Jillian Michaels for a bit and come back to a cooked hot meal. Oh, and it is a 2Chili-pleaser to boot. Though, I have recently been informed he doesn’t really like spinach much. This revelation came after I have made this lasagna numerous times to practically thunderous applause. For those in a similar anti-spinach situation, check out fellow Project: Food Budget blogger MeloMeals’ white bean ricotta, which I think would be a lovely substitute for the spinach. 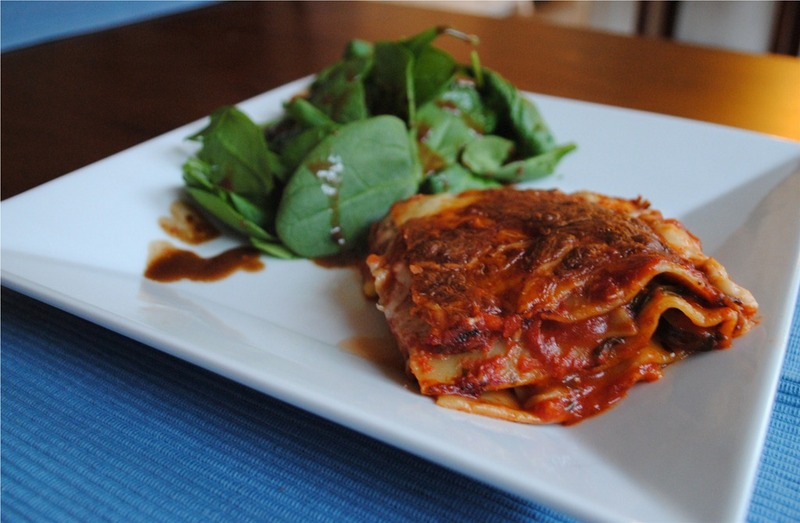 Spinach or no spinach, he gobbles this lasagna up, and notes that he particularly enjoys the cheesy top layer. I am all about spinach, so no complaints here. In a medium frying pan, heat olive oil over medium heat. Sautee the zucchini until it is just tender, about 5 to 7 minutes. Fully cover the bottom of an 8×8 baking pan with pasta sauce. Layer 4 or 5 of the uncooked lasagna noodles (I overlap them to account for shrinkage). Add the zucchini and cover with sauce. Add another layer of noodles followed by the spinach and another layer of sauce. Add one more layer of noodles, sauce, and cheeses. Bake for 45-50 minutes until noodles can easily be pierced with a fork. Note: The key with the sauce is to put enough to fully cover each layer. Enough sauce is what makes the noodles cook through and not get crunchy, which is especially important on the top. Also, pre-made pasta sauce is one of the worst offenders of added sodium – and if you’re not careful, you could be way, way, way overdoing it on sodium. Choose a low-sodium variety (less than 50 mg per half cup. Most commercial sauces have about 400-500mg per 1/2 cup – yikes!). This is based on 4 cups of Walnut Acres Low Sodium Tomato Basil sauce, which is a pretty low calorie sauce. Your actuals may vary based on what sauce you pick. This one is a keeper at our house, for sure. It is tasty, easy, and nutritious. And there is no boiling. I call that a win all the way around! I think I am late to this party. But, I’m going to join in anyway. And, I bet you will too. Next time you have a glass jar of almost empty almond or peanut butter, pour your hot oats, quinoa, or bulgur into the jar, stir, and YUM. The hot temperature from the cooked oats (or whatever grain) helps melt the nut butter, which is inevitably kind of dry since it’s whatever’s left after all the creamy parts have been used up. It’s an easy way to get that last bit of nutty goodness out of the jar, and makes a convenient and portable vessel for your cereal. I I wouldn’t recommend this in a plastic jar, by the way, though you could perhaps do overnight oats in a plastic jar. For my first endeavor in this technique, I used quinoa flakes, and it was doubly delicious. 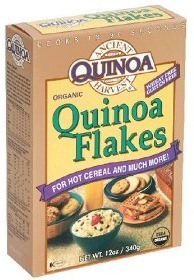 Quinoa flakes are a great sub for straight up quinoa because they cook in 90 seconds instead of 45 minutes. They’re also a little milder than quinoa, with more of an oatmeal texture. I have used them in baked goods in place of oatmeal, though I am on the fence as to which I prefer for that application. 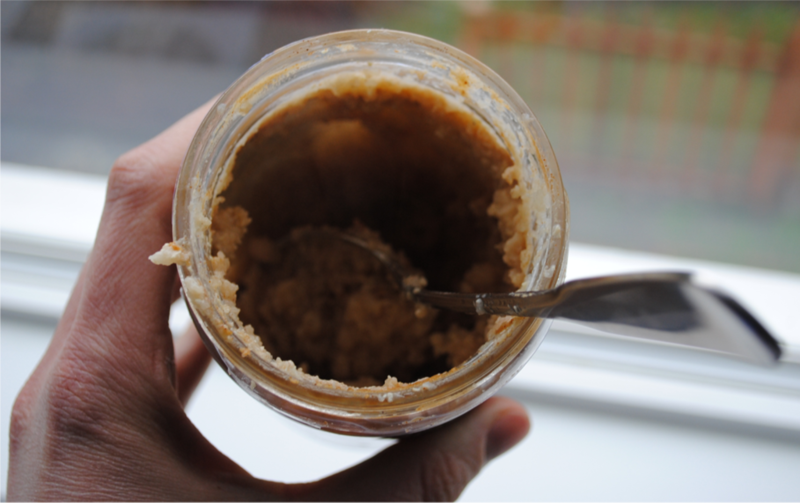 So, there you have it, a quick tip to use up the nut butter, and an excuse to go buy more so you can do it all over again! Why the asterisks, you ask? Well, most puddings don’t have tofu as the main ingredient. But then again, I very rarely do what most people do! Speaking of tofu, we have a very tenuous relationship. We want to get along, we really do. In fact, I have tried to make tofu in a few different manners over the past few months, but none of those endeavors have been particularly successful. I drain and I press, but my results are never like our favorite Teriyaki restaurant – crisp and evenly cubed. I usually have slightly mushy and inconsistently cut tofu. But, I’m not giving up. The beauty of tofu, aside from being cheap and a relatively good source of protein, is that it pretty much takes on the flavor of whatever sauce or spices you’re using. Which leads us to the pudding. Okay, so it’s not pudding in the traditional sense of the word. 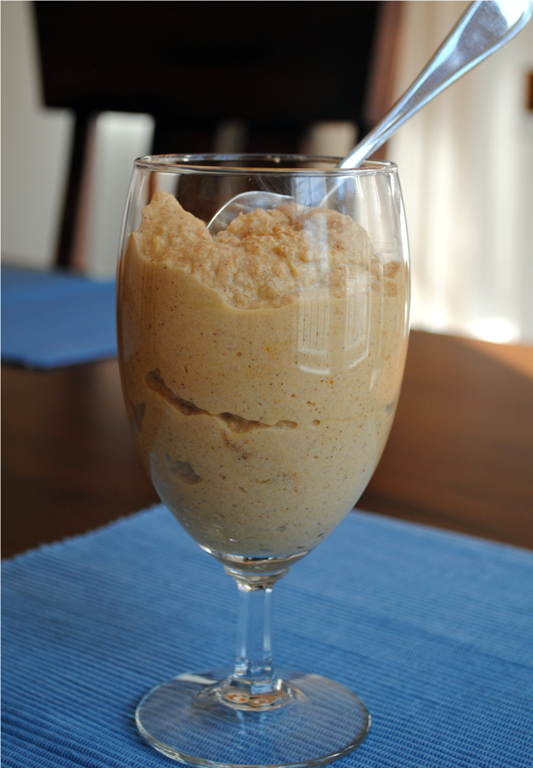 But, it does taste like pumpkin pie filling, and has a somewhat pudding-like texture, so that’s what I’m calling it! Most of my hair-brained ideas come from something that needs to be used up. Necessity truly is the mother of all invention, I guess. The apple lentil muffins were that way, most frittatas and scrambles are that way, and, this completely surprising dessert is that way. Yesterday I had a block of tofu that needed to be used in the next few days, and rather than cook it up for dinner, I had a crazy idea: What if I blended it up into a smooth texture? I originally thought I’d make banana pudding, but I remembered I had a couple cans of pumpkin hanging out in the pantry and my bananas were not quite ripe. And, so, pumpkin it was. A good choice! Note: if you have pumpkin pie spice on hand, you could use 1 teaspoon of that instead of the cinnamon, ginger and nutmeg. It’s Saturday, it’s Saturday! Yeah! I’m off to tackle a two hour bike ride this morning, hoping the frost on the roads melts by about 9:00. I hope you’re off to do something fun today as well! What to buy and what to skip at Trader Joe’s – Shine on Yahoo! It is no secret that I am part of the legion of folks that “heart” Joe. I really dislike going to the grocery store in general, but with TJ’s, I can get in, get what I need, and get out in a jiffy. There are things I don’t really buy there (produce thanks to my CSA), and things I only buy there (olive oil, honey, nuts, 2Chili’s cereal). I found this article pretty spot on with my experiences of what to buy and what to skip. The V8 Health Halo – Fooducate. I am so happy to see Fooducate calling out V8 on its claims. I have always said V8 is really not that healthy, and it certainly is not a health drink in any way, as it is packed with sugar and salt. Anyway, high five Fooducate! “Wall of Green” Soup – Choosing Raw. I plan on making this soup today or tomorrow to leverage a big pile of greens from our CSA box this week. Perfect timing, thanks Gena! After Menu Labels, Parents and Kids Order Same Foods – New York Times. I find this completely unbelievable. We have a similar law in King County in Washington that requires any restaurant that is a chain to post their calorie counts clearly on the menu. 2Chili told me he observed someone ordering roughly 3,000 calories of food at Wendy’s yesterday, completely un-phased by the calorie counts staring him in the face. I personally enjoy seeing calorie counts to help influence my dining decisions, but clearly, just putting the info out there isn’t enough to sway some people’s decisions.